The Golden Retriever has a delightful temperament, positive attitude & easy trainability.. For all the breed's fame and popularity, the Golden Retriever hasn't been around for very long.. In fact, this breed has only been officially named the "Golden Retriever" for less than a century, with a long, feathered double coat and a golden rainbow of shades, and eyes dark to medium brown. 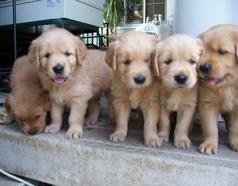 Goldens are loving and affectionate. They’re very loyal and want to please. They love getting in the water and are friendly with children and other dogs. They crave human attention and need to feel part of the family. The dogs are easy to groom with a bath and regular brushing and usually live for 12-14 years. They NEED exercise everyday, but, if they get this, are fine for condo living. They are easily trained and eager and willing to please their masters. We hand raise the puppies, and they are watched and monitored 24/7. From an early age they live and interact with family and friends, that includes adults, children, other dogs, cats, just about anything we can safely introduce them to. We take two or three at a time out in the car to visit various places and to meet strangers, shopping, meetings, friends, even the coffee shop, although they are too young to drink it. We treat the puppies as if they are going to be our own personal pets. We love them, cuddle them, play with them and teach them it's not alright to use those needle sharp baby teeth on our skin, our shoes, the plants, or on that chair leg. On March 30, 2010, Jordan and Charlie produced a litter of 13 puppies, 5 males, 8 females. They ranged from light to medium gold and were just beautiful. If you are interested in one of our puppies please see contact information. We can make arrangements for you to come and visit the puppies and make your selection. This is Charlie, the father of the March 30, 2010 litter of puppies, see pictures below. He resides in Cool, CA with his owner. They are all in their new homes. SR41000704 "CHARLIE VALENTINE OF THE HOLLOW"
Also see below two of the pups practically grown up at 7 months old. Left is Bear from Plumas Lake, next is Buddy from Lake Tahoe, the 3rd picture is of Buddy at 3 years old, 4th is Bear at 4 years old, 5th is Buddy at 4 years old. Pictures sent by their proud owners. Thanks owners, we love getting updates. We think they look like their Daddy Charlie.. 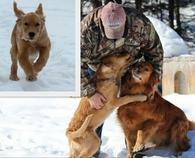 The picture on the left is Marley with his little boy, he is from Levi and Aja's litter in August, 2012. 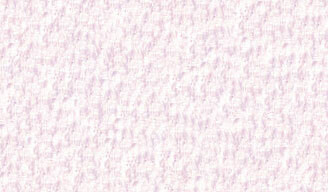 We also had a litter from them March 28, 2013, see Home page.. 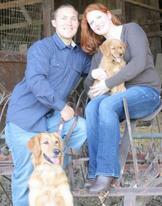 The one on the right is Maggie with her little girls, she is from Aja and MyTy's litter in 2011. Looks like Dad's three angels. ​The one on the left is Maverick, brother to Marley (see above, also brothers Taye, Duke & Andy on Home page). Lucky boy, enjoying the snow with his Dad and big brother Buddy. The one on the right is Taylor, sister to Marley & Maverick, with her owner, they reside in Grass Valley, and I'm told Taylor also loves the snow. ​The one on the left is Bandit with his owners and big sister Haley, brother to Marley, Maverick and Taylor above. 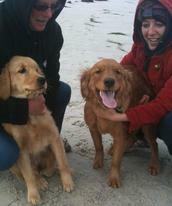 The picture was taken around 8 am on a Monday morning in February 2013, on the beach in Monterey, where the two owners accidently ran into each other and found that they had both gotten their puppies from us. Small world huh!! The owner says, "what are the odds". ​To the left, see Tiger Lily, sister to the pups above and Benjamin below, and Taye, Duke & Andy on Home page, from Aja and Levi's August 2012 litter.. She used to fit in the mailbox, I'll bet she doesn't now..
​The two pictures to the left are of Benjamin, brother to the pups above from Aja & Levi, August 2012. His owner is a student at U C Davis Veterinary School of Medicine, she says he goes to school with her and is quite well known there..
See Benjamin at a year and a half old. His owners say he is very vocal and greets them whenever he sees them, and is quite a talented fellow. 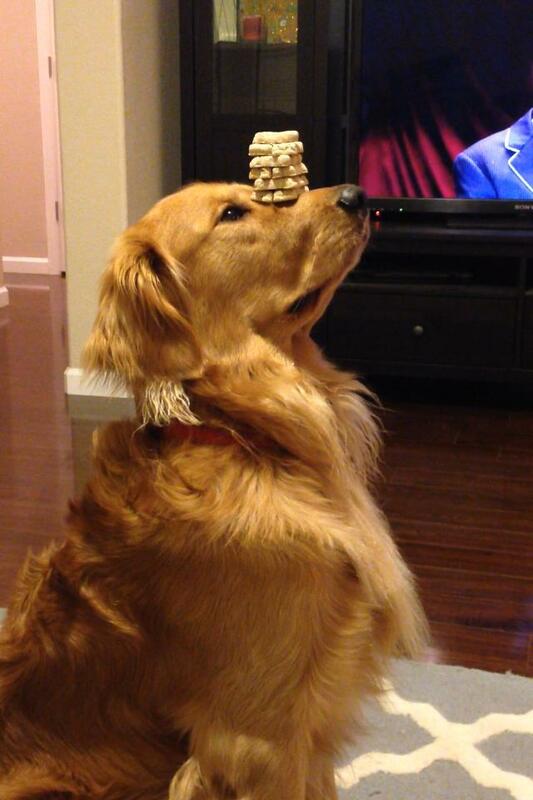 Looks like he is taking after his father Levi with the balancing ability, although he prefers cookies and Starbucks.. We think he is quite a "Pretty Boy"..
Pictures sent by their proud owners. Thanks owners, we love getting these pictures.